Martin produced many works in sepia or grey wash in his early career. This corresponds closely with the finished oil of 1812 (shown at the RA in 1813, no. 211). The only significant change is the precise position and pose of the two figures. 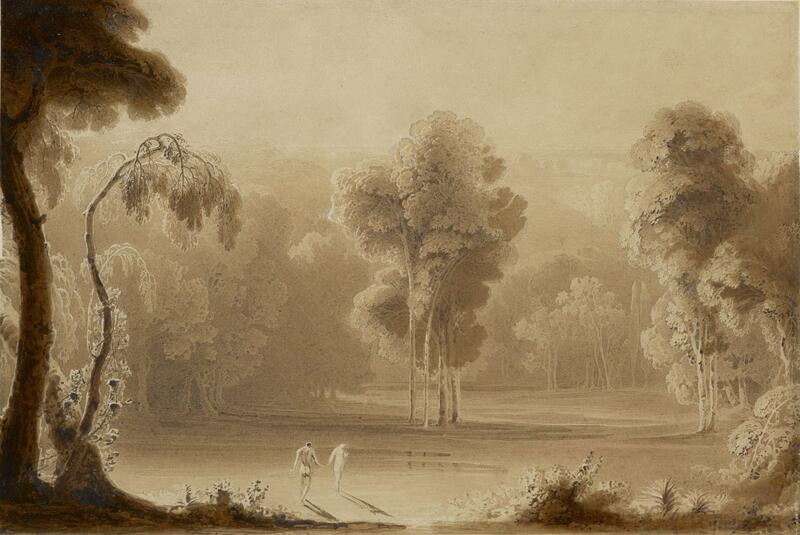 Another sepia study of this exact same subject is in a private British collection (it is signed and apparently dated 1812 but lacks the central group of trees). Michael Campbell judges this to be the more developed of the two studies and suggests that it is the immediate precursor to the oil. Martin repeated the subject in `The Garden of Eden` of 1821 (Tate Britain), for an aquatint by T. Fielding entitled `Paradise` (1825) and in many associated subjects for Milton`s `Paradise Lost` (1824-1827), a number of which were transformed into oil paintings.